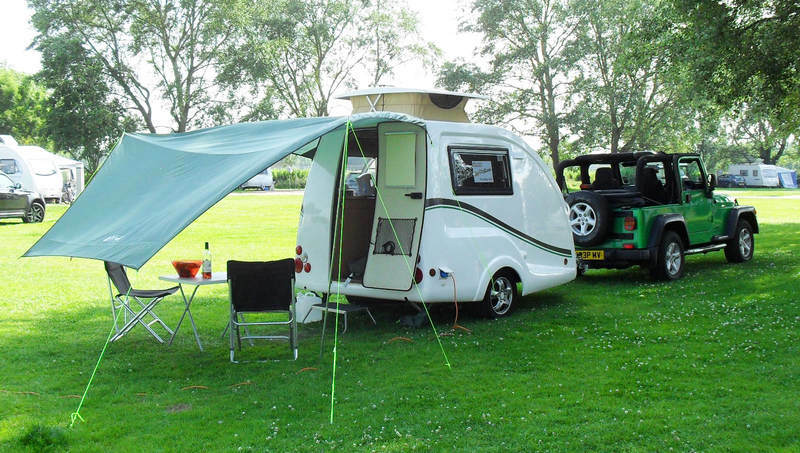 The Go-Pod Awning - Set Up Advice. - Go-Blog! Comments, tips & reviews. Go-Blog! Comments, tips & reviews. 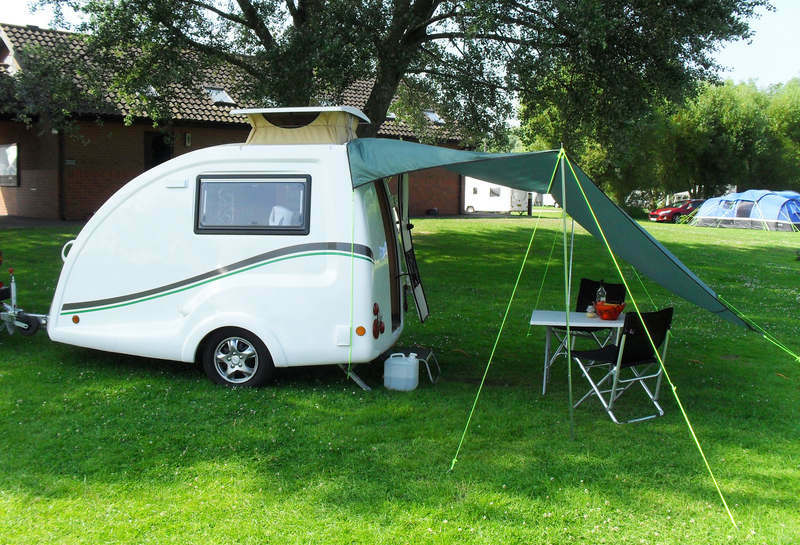 "I would like some advice on the best way to fit the awning to my Go-Pod please. Any tips would be gratefully received!" Most owners use the two front guy ropes on the awning and tie them forward to the Pods' front grab handles. Ensure both ropes are the same length and tie them off so that the fabric of the awning stays just shy of the Go-Pods pop top opening. The ropes should lie along the top surface of the Go-Pod and not be crossed. Some people use 'S-hooks' to fix to the handles so that it’s quicker and so the guy ropes are always the same length, every time. So, firstly erect the awning so that it's free standing & affix the front ropes to the grab handles. Then peg down just the open end of the elasticated tunnel section, well underneath the Go-Pod itself - near by the stabiliser legs - on both sides. This will secure the bottom part and keep the elastic sides nice and tight. Next walk the whole awning structure backwards away from the Go-Pod until the tunnel goes nice and tight. Ensure that the whole structure stays as straight and as squarely aligned as possible. TIP: Then taking the two guy ropes from the very back of the awning, peg them down tightly backwards, in a direction that's away from the Go-Pod. So in other words, directly backwards in a straight line. This has the affect of further tightening the tunnel section. With all the doors and the inner divider of the awning zipped down, peg down the awning's legs. Stand back and check if it looks right before proceeding to peg it down further. Adjust if necessary. Start to peg it down. Pegs are provided with the awning but it's a good idea to take some extra, metal hardstand pegs and a club hammer. Those are the pegs that are like 6” nails & work in every scenario. Watch that the webbing straps between the awning's legs aren't wrapped around the feet and that they are as taut as possible when you peg it. Its normal for it be a little different each time, due to the lay of the land and so on but with some care & practice, you'll find its a really great awning, even in pretty strong winds! Some people add a strip of awning bead to the top of the tunnel end, instead of using the forward guy ropes method. Having tested both ways, we feel that neither has any major advantages and that this is a matter of personal preference. Stitching a bead in place is best done with an industrial sewing machine, while stretching the elasticated section out flat. We did work with Khyam one season to produce a special Go-Pod version of the awing which had awning bead attached and the Go-Pod logo. However, as the production quantities we were able to order were relatively low, this was dropped when the item became outpriced. 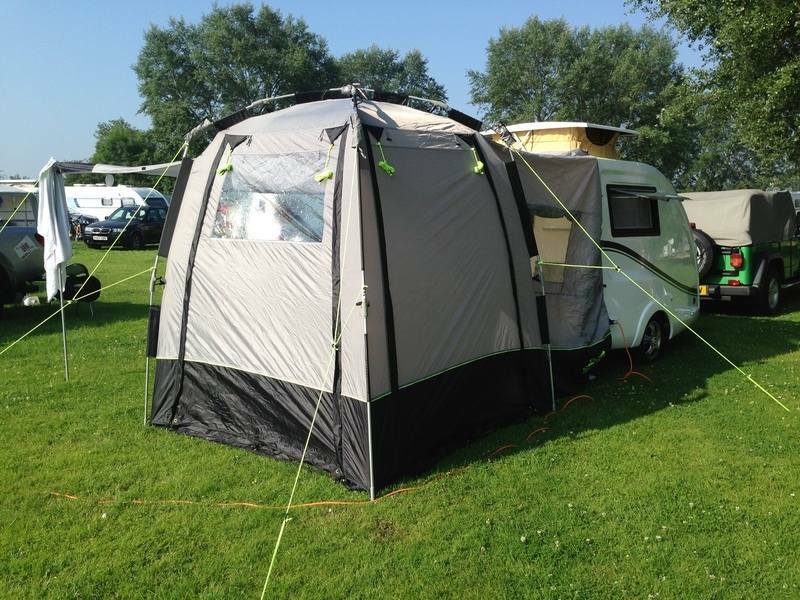 The regular Khyam awning supplied now is offered at the same RRP as the manufacturers and is included within the PLUS and Platinum models.